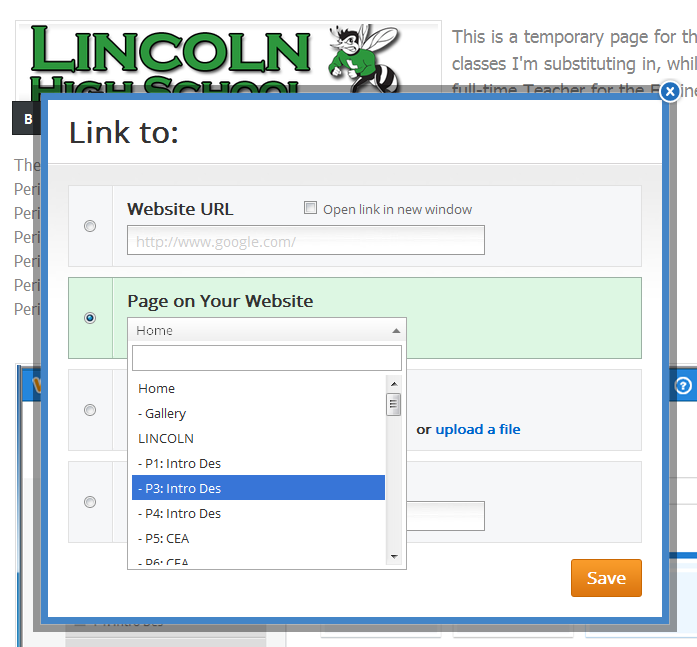 Clicking the icon, "Lincoln High School" links to Lincoln's website. Click the image to the left or THIS LINK to download a copy of the webpage worksheet. Click the play button on the controller to the right of this box to listen to the lecture on how to begin building your website. Below are a few screen captures showing the selections for adding pages and links in Weebly, and to the right is a recording of my first lecture for the assignment. Until another teacher was hired, students began this course creating a website which will include a resume, a brief biographical sketch, a blog (for reflective writing assignments), and a Contact page, which will allow for comments made by other students, and "threaded discussions," for feedback from the instructor, their peers, parents, other teachers and the Administration. 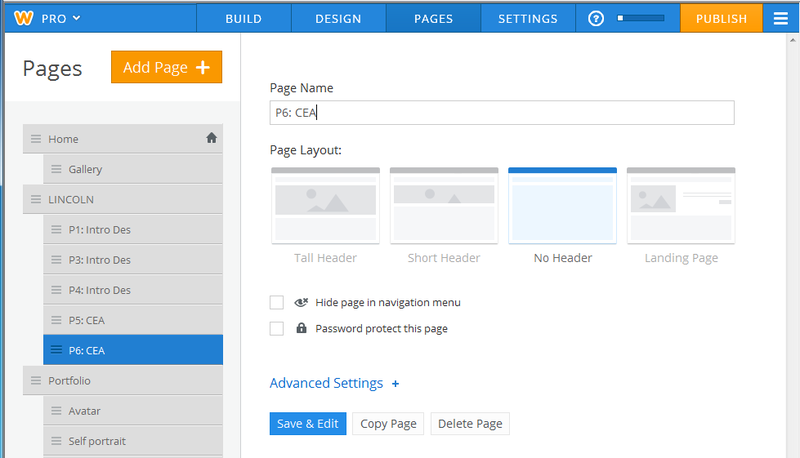 Creating a new page is simple: Click the orange box that says, "Add Page+" and type the page Name in. To rearrange pages, simply click and drag them up or down and the order of appearance will change. Dragging one page below another and to the right will make it a subordinate page, and automatically act as a pull-down menu, or hierarchical page. 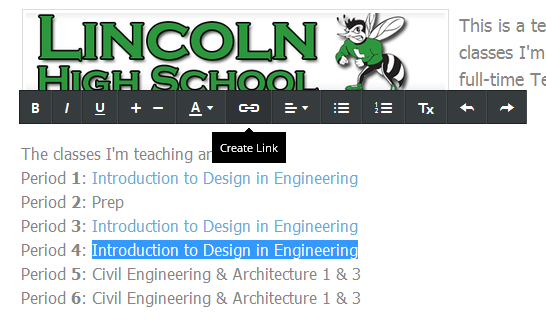 To create a link anywhere on a page, simply highlight the text (or image); as soon as you do, this menu pops up; click on the chain icon to create your link. The window to the right pops up so you can link it to another website or another page on your own. Choose which page it links to and click Save." It's that simple. When at all possible, make sure to contact all external link owners, to see if they will agree to link back to your site. Also, ALWAYS click the box at the top that says, "Open link in new window." The reason you do this is so your page stays open, and viewers will be able to get back to your page easily. This is especially significant, if the site owner of the other site does not agree to link back to your site.